El Paso, TX: Two of the #ElPaso9 hunger strikers were deported on Thursday, February 28th from the El Paso, TX Processing Center (EPPC). The two deported were among the Sikh men seeking asylum who have been on hunger strike, some for over 60 days. Amrit Singh, the uncle of two of the men who remain detained in El Paso, was notified of the deportation early Thursday. Immigrant and civil rights groups are deeply disturbed by this development. In early February, Rep. Veronica Escobar (D-TX), who represents the Congressional District where the El Paso Processing Center is located, requested independent psychological and medical assessments of the men after the doctor in the El Paso facility cleared the men on hunger strike for their deportation travel. ICE has neither acknowledged nor fulfilled the request. The “El Paso 9” have been subject to intermittent and involuntary force-feeding and solitary confinement since January. The men were on hunger strike to protest the ongoing delay in hearing their cases and verbal and physical abuse by the guards. Some of the men are still on hunger strike. On February 8th, 27 immigrant and civil rights groups sent a letter to Department of Homeland Security (DHS) Secretary Kirstjen Nielsen demanding the immediate release of the nine men on hunger strike and for an investigation into the facility. DHS has not responded to the letter. Advocates across the country have been calling the El Paso ICE field office all month to stop the deportations of the #ElPaso9, but it appears their phone lines have been either rerouted or disconnected. Jennifer Apodaca of Detained Migrant Solidarity Network said, “Deportation continues to be used as a final and cruel form of retaliation by ICE to target individuals who have witnessed and speak out against abusive treatment and violation of civil rights. ICE continues its practice of evading accountability by deporting individuals to ensure that those with critical information are gone, essentially erasing evidence. We demand that all deportations be halted immediately until the full set of information is made public. Desis Rising Up & Moving (DRUM) organizes low income South Asian and Indo-Caribbean immigrants, workers, and youth in NYC for educational, immigrant, racial, worker, and gender justice. The South Asian American community is one of the fastest growing demographic groups in this nation and spans a rich diversity of immigration statuses from undocumented to Deferred Action for Childhood Arrivals (DACA), to Temporary Protected Status (TPS) to asylum seekers to H-1B and H-4 visa holders to green card holders. As we grow to over five million South Asians in the United States, the diversity of our population has also grown. Nearly half a million Indian-Americans alone are undocumented. As India ranks one of the top ten countries of origin for DACA recipients, 3,600 Indian Americans obtained DACA since 2012. Nearly 1,879 Pakistani Americans and 594 have applied and received DACA. Over 9,000 Nepali Americans are at risk of losing TPS in June 2019. In fiscal year 2018, South Asians have been detained in 16 out of the 19 border patrol sectors across the country ranging from Rio Grande Valley to Vermont. Since 2015, over 90% of the H-4 visa holders granted employment authorization are from India, and may lose their work permits with an anticipated rule from this current administration. Our nation’s immigration system has been broken and unjust for centuries: from enslavement to forced migration and displacement to discriminatory quotas based on country of origin to the present day. Today, deportations have rapidly increased, the border has become militarized, citizens are being denaturalized, and authorized immigrants are aging out their visas, being denied work authorization, and unable to obtain green cards. SAALT has been consistently engaged in the fight for undocumented South Asian Americans, DACA recipients, TPS holders, asylum seekers and refugees, and H-4 visa holders. We believe these populations within our community are the most vulnerable and have the least attention, resources, and advocacy dedicated at the national level. In today’s fractured political climate, we have observed a disturbing trend. Some immigrant rights advocacy groups are advocating for immigration policies that benefit them, but harm other immigrant groups. One such example is using green card processing fees to fund a border wall, which we discuss in detail later in this guide. Comprehensive immigration reform that truly transforms our immigration system is the only path forward to address the struggles of all immigrant populations. SAALT does not support any solution, legislative or otherwise, that would advance the rights of one group of immigrants at the direct expense of another group. In this guide, we lay out SAALT’s perspective on the political and advocacy landscape for H-4 visa holders who stand to lose their hard fought work authorization and H-1B visa holders and others who face indefinite wait times for green cards. What is an H-4 Visa? The H-4 visa is issued to spouses and dependent children of H-1B visa holders, also known as “highly skilled workers” employed in specialty occupations requiring relevant bachelor’s or advanced degrees. Since 1997, more than 1.7 million individuals have received H-4 visas. According to the State Department, the overwhelming majority (nearly 90%) of these individuals are of South Asian descent. In December 2017, the Department of Homeland Security announced its intent to rescind Employment Authorization Documents (EAD) for H-4 visa holders, which will revoke their right to work. A Notice of Proposed Rulemaking (NPR) is expected to be published as early as January, 2019. This proposed rule is a direct outgrowth of this Administration’s “Buy American, Hire American” executive order, which guts employment protections, benefits, and pay for foreign workers, targeting H-1B and L visa holders. Stripping the hard fought work authorization of H-4 visa holders, granted to some spouses and minor children of H-1B visa holders through an Obama-era rule is yet another component of this administration’s anti-immigrant agenda. Please see here for a more detailed guide on this important issue. What is a “legal DREAMer” and why should I care? Minor children, who age out of their H-4 visa at the age of 21 and must bridge to a student or other visa to remain in the country, have been called “legal DREAMers” by some advocacy groups. Please see here for guidance from South Asian immigration attorneys around the country who explain the shared plight, but important distinctions between H-4 visa holders and DACA recipients. This framing as legal “DREAMers” is flawed. It creates a “hierarchy of the deserving,” utilizing divisive arguments about who should be “first in line” rather than viewing an entirely broken immigration system that serves no one. What can we learn from DREAMers? We have many DACA recipients or DREAMers within our own South Asian American community. The DREAMers have been successful in winning over 75% of the American public and Members of Congress, who support them remaining in the country with a path toward citizenship. They have accomplished this because they are unwilling to sacrifice any other group of immigrants to win, all while facing the threat of deportation themselves every day. In fact, they have joined forces with Temporary Protected Status (TPS) recipients to demand that the next Congress pass legislation that combines protections for both DACA and TPS recipients within the first 100 days, which will likely happen. If they can exemplify this level of leadership and collaboration, then we must follow their example and find ways to jointly address the problems facing authorized and unauthorized immigrants instead of insisting that DREAMers go to the back of the line. What is H.R. 392 and how does it resolve the green card backlog? Indians in the U.S. have among the longest wait times for green cards. The reason? Current immigration policy does not allow one particular country to account for more than 7% of visas leading to a green card in any given year. This means countries that fall below the 7% threshold have much shorter wait times than large countries like India, which has among the longest green card backlogs. The “Fairness for High Skilled Immigrants Act of 2017” (H.R. 392 in the House of Representatives & S. 281 in the Senate), first introduced by Rep. Chaffetz of Utah and Rep. Lofgren of CA and most recently championed by Rep. Yoder of Kansas following the murder of Srinivas Kuchibhotla by a white supremacist at a Kansas bar in his Congressional District, would lift the 7% green card cap in an effort to clear significant backlogs. However, helping clear the green card backlog for Indians does not actually eliminate the backlog, it simply moves it around to other countries. At this time, the language of H.R. 392 has been included in the House appropriations (funding) bill for the Department of Homeland Security (DHS). While the Senate passed a Continuing Resolution in an effort to avoid a government shutdown, neither the House nor the Senate passed the actual Homeland Security appropriations bill. The Senate version of this bill does not currently include language about lifting green card caps. If the House language is included in the final version of the appropriations bill, it could pass each chamber and ultimately be sent to the President for signature. Even if the House passes the Continuing Resolution to avoid a government shutdown now, this would only delay the vote on the funding bill until February 8, 2019. How does H.R. 392 hurt some immigrant groups? While H.R. 392 has gained wide and even bi-partisan support, its proposal to remove green card caps does not actually increase the number of green cards available, but redistributes them by application date rather than country of origin. This inherently favors nations with much larger demand for green cards, most notably, India. But, this comes at the direct expense of countries with lower demand, who will experience higher wait times. Among South Asian countries, this puts green card applicants from Bangladesh, Pakistan, Sri Lanka, Nepal at a much greater disadvantage. Between 2015-2017, only 55,000 Pakistanis, 46,000 Bangladeshis 37,000 Nepalis, and 5,300 Sri Lankans obtained green cards. Comparatively, individuals from the top two countries of origin, China and India, obtained 228,000 and 190,000 green cards respectively. Additionally, not all green card applicants are H-1B visaholders. For example, foreign nurses are not eligible for H-1B visas and must obtain green cards to work in the United States. H.R. 392 would drastically reduce the number foreign-born nurses who could enter the country with green cards from 77% to 100% in the next five years and beyond, devastating the healthcare system. H.R. 392 ignores the real problem, which is a significant mismatch in immigrant visas overall to meet the demand for foreign-born, high-skilled workers across industries. Why is H.R. 392 not the best solution? In January, 2018 a “Dear Colleague” letter circulated by Congressional co-sponsors of H.R. 392 from both parties framed H.R. 392 as a potential solution for the “DACA problem.” In it they state, “H.R. 392 can be passed along with amended language containing a fee that can be assessed upon the beneficiaries of the legislation that will raise billions of dollars. These critical funds can be used to enhance the likelihood of passage of a DACA deal, by either enabling Congress to pay for border security or other items in a manner that does not increase deficits, burden U.S. taxpayers, or cause any opposition to the nature of the funding source.” This means the funds from additional green card processing fees would go toward further militarizing the border, possibly even funding this administration’s wall. In February, 2018 hundreds of Indian-Americans rallied outside the White House supporting this administration’s immigration policies, drawing attention to the green card issue. In particular, they held a sign saying “Dreamers pay for the wall” and offered to pay additional fees toward their green card applications to finance a border wall by supporting H.R. 392. The South Asian American community must categorically reject such a divisive approach toward immigration reform. What is a stronger solution? The Reuniting Families Act, which will be re-introduced in the new Congress, would improve our family-based immigration system, reunite and keep families together, clear the family-based backlogs and eliminate the country caps in both family and employment-based visas, rectifying the backlogs for all those seeking employment-based green cards. At a time when the administration is attacking immigrants from all directions, it is particularly important that we advocate for solutions that strengthen and unite rather than divide our communities. Please find the full Guide to Advocacy for Legal Immigration Reform here. In partnership with Asian Americans Advancing Justice (AAJC), National Asian Pacific American Women’s Forum (NAPAWF), and Immigrant Legal Resource Center (IRLC) we oppose the upcoming rescission of the H-4 work authorization rule. Oppose the Rescission of the H-4 Work Authorization Rule That Would Harm Over 100,000 Asian Immigrant Women. Please see here for the full H-4 Guide. In December 2017, the Department of Homeland Security announced its intent to revoke Employment Authorization Documents (EAD) for H-4 visa holders. A Notice of Proposed Rulemaking is expected to be published in the coming months. We encourage people to oppose this senseless, cruel and unnecessary rule. This rule will strip work authorization from over 100,000 women, forcing many to choose between work, family and their home. Below is a description of the rule and it’s disproportionate effect on AAPI women. The H-4 visa is a visa issued to spouses and dependent children of H-1B visa holders, who are foreign workers employed in specialty occupations requiring relevant bachelor’s or advanced degrees. Since 1997, more than 1.7 million individuals have received H-4 visas. Approximately 136,000 individuals received H-4 status in FY 2017. 1 According to the State Department, the overwhelming majority of these individuals are of South Asian descent; specifically, in FY 2017, approximately 86% of those who received H-4 visa status were from South Asian countries. What is the H-4 visa work authorization rule? In 2015, after several years of advocacy by community members, including local South Asian Women’s Organizations , the Department of Homeland Security (DHS) issued a rule allowing certain H-4 dependent spouses of H-1B visa holders to legally seek employment in the US. Once an H-1B holder is sponsored for 2 employment-based lawful permanent resident (LPR) status–or a green card–his or her H-4 visa holding spouse may apply for work authorization. As of December 2017, approximately 127,000 H-4 visa holders have been approved for work authorization under the DHS H-4 rule. However, many H-4 visa holders remain ineligible for work authorization as the rule only allows spouses of persons with an approved permanent immigrant petition to work, which continues to exclude thousands of others. Even this limited victory is now under attack under the current administration, which has proposed to rescind the hard fought work authorization. How would the rule impact AAPI immigrant women? H-4 visa holders at risk of losing work authorization are predominantly women from Asian countries. According to the United States Citizenship and Immigration Services (USCIS), 95% of H4 visa holders who have secured work authorization are women and at least 98% are from Asian countries, the vast majority from India (93%) and China (5%). How long will these AAPI women be without work authorization? For some H-4 visa holders it often takes 6 to 8 years to obtain a green card, but H-4 visa holders from India are stuck in H-4 status indefinitely. This is due to long backlogs in the availability of employment-based green cards for Indian nationals, so if Indian H-4 spouses lose their work authorization, they may never get to work in the U.S.
Why should you oppose the rescission of the H-4 Work Authorization Rule? H-4 dependents must be allowed to work for numerous reasons, ranging from their ability to contribute to the household to the value they provide in sharing their talents in our economy. Additionally, these individuals deserve the right to use and enhance the skills they have learned, be financially self-sufficient, thrive mentally and physically, and pursue their dreams. Lack of employment undermines the agency and dignity of dependent spouses Without work permits, H-4 dependent spouses, many of whom also have advanced degrees, are not only unable to contribute to the economic security of their families–they also suffer from feelings of being devalued, depression, and isolation. Revoking work authorization for H-4 visa holders would force them to return to what many call the “golden cage” or “depression visa” while also being dependent on their spouses’ employment for 5 immigration status. Without work authorization, H-4 visa holders experience a lack of dignity and agency over their well-being and future. The rule would harm H-4 spouses’ long-term career prospects Under the new rule, H-4 visa holders who have been employed since the 2015 rule went into effect would have to seek re-employment by obtaining their own H-1B visas, which are already in short supply. Moreover, jobs that sponsor H-1B visa holders are disproportionately in STEM fields, which are known to be particularly hostile towards women, especially women of color, in hiring and work environments. Rescinding work authorization fails to acknowledge the economic loss incurred by preventing H-4s from working. Many of these individuals might be interested in establishing a small business or founding an innovative company, yet are effectively barred from doing so because of our immigration system. H-4 visa holders without employment are less empowered to leave abusive spouses Studies have shown that immigration status prevents a large percentage of immigrant women from leaving abusive relationships, and that abusers often use immigration-related tactics. Work authorization for H-4 visa 6 holders who rely on their spouses for immigration status and financial stability can help provide them the resources to leave abusive relationships. Although certain abused H-4 spouses can apply for work authorization under the Immigration and Nationality Act (INA), as amended by the Violence Against Women Act (VAWA), this 7 status can be very difficult to obtain: dependent spouses are less likely to report abuse, much less produce evidence of abuse in the form of police reports, medical records, and other documents. Rescinding work authorization limits the success of H-1B workers and their H-4 dependents The proposed rule limits the success of H-1B workers, their families, and our nation’s economic growth. The ability of H-4 dependents to contribute to their household and our economy is critical to the long-term success of H-1B workers. Not surprisingly, individuals are better able to succeed with the support of their loved ones and the economic impact of having a multi-income household cannot go unnoted. To rescind this rule and terminate work authorization would force many spouses and children of H-1B visa holders to return to their previous personal and economic hardships, potentially place them at risk of isolation and abuse, and remove significant economic benefits to the U.S. economy. What can you do to stop this harmful proposal? The Department of Homeland Security is expected to revoke work authorization for H-4 visa holders in the coming months. However, the administration must first publish the proposed new regulation and invite public comments before the new policy goes into effect. During this 60-day comment period, the general public is invited to submit in writing their opposition to the rule and how it would impact them. We encourage immigrants, advocates, and friends and family of H-4 visa holders to submit comments expressing opposition to the proposed rule and calling for work authorization for H-4 visa holders to be left intact. We call on Members of Congress to speak publicly in support of the ability of H-4 visa holders to work, to advocate with the Department of Homeland Security to leave the H-4 work authorization rule intact, and to support legislative efforts that protect H-4 visa holders and their families. On October 10, the Department of Homeland Security (DHS) published a proposed “public charge” regulation. This rule expands the definition of public charge and targets anyone who uses applicable health, nutrition, or housing support programs. If the government determines that someone is likely to become a “public charge,” that person can be refused lawful permanent residence (“green card”),change/extension of non-immigrant visas, or entry into the U.S. The proposed rule will NOT affect: individuals applying for naturalization, citizens, refugees, asylees, VAWA petitioners, T or U visa applicants/holders, and other specific cases. How does public charge negatively impact South Asians? Nearly 472,000 or 10% of the approximately five million South Asians in the U.S. live in poverty. Among South Asian Americans, Pakistanis (15.8%), Nepali (23.9%), Bangladeshis (24.2%), and Bhutanese (33.3%) had the highest poverty rates. Over 10% of green card recipients in FY 2016 were from South Asian countries. Nearly 61% of non-citizen Bangladeshi American families receive public benefits for at least one of the four federal programs including TANF, SSI, SNAP, and Medicaid/CHIP, 48% of non-citizen Pakistani families and 11% of non-citizen Indian families also receive public benefits. If this rule goes into effect, a significant percentage of the nearly 5 million South Asians living in the United States would become a “public charge” simply for using public benefits they are entitled to. If you receive public benefits, you should continue to stay enrolled! Contact your Congressional representative: 202-224-3121 and tell them how this proposed rule would impact you. Posted in Immigration, policy, resources	| Tagged "public charge"
The Department of Homeland Security published a new proposed “public charge” ruletoday that would deny permanent resident status (“green cards”) to lower income immigrants who use government services such as nutrition programs and housing assistance. The proposed rule was officially published in the Federal Register, triggering a 60-day period for the public to comment before the Department of Homeland Security proceeds with final rulemaking. This rule punishes people for using the public benefits they are entitled to and is set up to prevent as many immigrants as possible from becoming legal permanent residents. It’s the latest in a series of attacks on all immigrant communities and their children. The rule directly impacts immigrants who are applying to become Lawful Permanent Residents (LPR’s or green card holders) or looking to extend or change the category of a nonimmigrant visa. If finalized, the Bangladeshi community would be the hardest hit among South Asian Americans. Nearly 61% of non-citizen Bangladeshi American families receive public benefits for at least one of the four federal programs including TANF, SSI, SNAP, and Medicaid/CHIP, according to a 2018 Migration Policy Institute Report. The same report showed that 48% of non-citizen Pakistani families and 11% of non-citizen Indian families also receive public benefits. Additionally, the proposed rule would flag all immigrant households of four earning less than $63,000 under negative scrutiny for the “public charge” test. The impact of the rule would be felt across the South Asian American community, as over 10% of green card recipients in FY 2016 were from South Asian countries. Nearly 472,000 or 10% of the approximately five million South Asians in the United States live in poverty, according to a recent Pew Research Center study. In 2015, eight of nineteen Asian American groups had poverty rates higher than the U.S. average. Among those, Pakistani (15.8%), Nepali (23.9%), Bangladeshi (24.2%), and Bhutanese (33.3%) Americans had the highest poverty rates among South Asian American groups. The same study showed that Bangladeshi and Nepali communities had the lowest median household incomes out of all Asian American groups, which fell far below the $63,000 threshold. We encourage South Asian Americans to visit SAALT’s campaign page and easily submit a comment opposing the discriminatory “public charge” rule before December 10. Washington, D.C., South Asian Americans Leading Together (SAALT) condemns the Department of Homeland Security announcement of new proposed “public charge” rules that would deny permanent resident status (“green cards”) to immigrants who use government services such as nutrition programs and housing assistance. The new rule would also weigh age, health, and employability as factors to deny green cards. SAALT, along with immigrant and civil rights, public health, and labor organizations, are denouncing these changes that threaten families and children’s health. The proposed rules would relegate immigrants who are not yet citizens to second-class status by condemning their use of critical public benefits programs. If implemented, the public charge regulation would undermine the safety, health, and security of immigrant families. Rumors of the proposal have already sown fear among immigrant families, many of whom have foregone essential health and nutrition services for which they are eligible. The new rule would hit South Asian American communities particularly hard, as over 10% of green card recipients in FY 2016 were from South Asian countries. According to a recent Pew Research Center study, one in four immigrants in the U.S. from Bangladesh and Nepal and one in three immigrants from Bhutan already live in poverty. This new rule would put all of these individuals at great risk. The term “public charge” predates federal immigration law entirely. In the early 1800’s states would only free individual slaves on the condition that they never become a “public charge.” This framework is now being expanded to criminalize immigrant communities. “This policy is about who this Administration considers a desirable immigrant. It is designed to instill fear in immigrant communities of color and relegate non-citizens and their families to second-class status. It will punish immigrants who rightfully access the public benefits to which they are entitled, it will punish parents for taking care of their children, and it will force immigrant families to choose between citizenship and basic needs. Rather than taxing the 1%, this Administration chooses to punish immigrant families over and over again. Today, on the one-year anniversary of Muslim Ban 3.0, we say no to more racist and anti-immigrant policies,” said Suman Raghunathan, Executive Director of SAALT. Once the rule is officially published in the Federal Register, the public will have 60 days to comment on the proposed rule before the Department of Homeland Security proceeds with final rulemaking. Stay tuned for SAALT’s campaign to channel public comments to the federal government opposing this discriminatory proposal. SAALT’s Young Leaders Institute (YLI) is an opportunity for undergraduate students and other young adults to build leadership skills, connect with activists and mentors, and explore social change strategies around issues that affect South Asian and immigrant communities in the U.S. 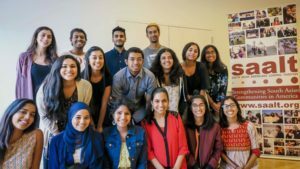 The 2018-2019 YLI cohort will identify strategies and craft projects to support those highly impacted at their academic institutions and/or local South Asian communities. We encourage projects that center and uplift caste oppressed, undocumented, working class and poor, Muslim, and Sikh groups. All projects should also incorporate a civic engagement and social media component.